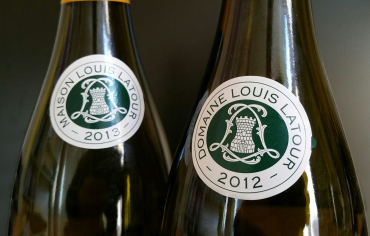 A catch-up on some wines from one of the most important names in Burgundy, Louis Latour. I wrote extensively on Latour’s holdings, from Chablis down to Beaujolais, recently, but these four wines come from their heartland of the Côte d’Or in Burgundy. Latour is both a négociant, vinifying grapes or parcels of wine bought from other growers, and a significant vineyard owner, vinifying their own fruit. The key to which is which in the bottle you buy lies in the small roundel on the neck of the bottle: Maison Latour signifies it is a négociant wine, Domaine Latour isays it is an estate wine. (2016) A year older than the Montagny 1er Cru also tasted, but a different style too, this richer and more buttery, with a sheen of creamy oak over riper fruit. In the mouth that nuttiness and Cox's pippin character give more weight and there is more texture, the extra ounce of ripeness nicely offset by some grip and keen acid in the finish. Delicious. (2016) From Latour's 1er Cru vineyards in the Côte Chalonnaise, this has a pale lemon/straw colour and crisply-defined, lightly leesy aromas with dry apple fruit. Understated white Burgundy, it reveals a little nuttiness and loads of biting lemon fruit and acidity, a lick of salt too, in a nervy, delcicious but linear wine. (2016) This vintage has no UK stockists listed, though the 2013 tasted recently is available and scored 91 points. This retains a touch of green to the colour and has a gorgeous nose, suffused with a little crushed almond and oatmeal, a ripe but crisp apple fruitiness and hint of salty minerality. The palate too has a fine marriage of lean, citrus and salt-streaked clarity allied to gentle nuttiness and fine orchard fruit. A delightful white Burgundy. (2016) Maranges is one of the less familar names of southern Burgundy, its appellations status granted only in 1988. This is a really nice, understated and fairly lean style of Pinot Noir, but not without its subtle floral charms aromatically, and with excellent clarity on the palate, if a little lack of fruit depth.